Not A Model: Are you flat? If anyone ever asked me to drink a glass of sparking water a few months ago, I would have spit a mouthful of fizzy liquid in their face. While that is a large exaggeration, it was an indisputable truth that I didn't enjoy the stuff very much. Lately, I feel that small changes in my tastes, interests and views surprise me. There are things that I never thought I would like or want to do and yet I find them flooding my mind with new possibilities. It makes me wonder about all of the things that I've previously dismissed and how many of them did I give a fair chance? People are so quick to say, "I would never be the type of person who..."
However, I find it's always the people who say, "I would never do that job" or "I would never spend all of my time with a significant other" or "I would never get hair extensions" that end up finding themselves in a situation that causes them to re-evaluate or change their stance. So sparkling water, yes, I've been guzzling it even though I used to despise it. Suddenly, there is nothing more refreshing than a glass of non-alcoholic bubbly. And really though, nothing is worse than being called flat (not in the chest way) but in the generic, boring, same old kind of way. It's about trying something new, even if you think you wouldn't necessarily like it, or be good at it. I drew the above photo with this design app and realized that I can draw silly things even though I'm not a design expert or know how to use special software. I'd much rather try and find the sparkling in my flat life. Wouldn't you? Love the bubbles and then for the new app... me likey. You should feature more of your drawings on the blog! And my dear, your life is far from flat and I don't think you should see being "flat" as a negative. Yes, sometimes things are the "same old" but that is what makes those things great! I think there is far worse things than being flat. 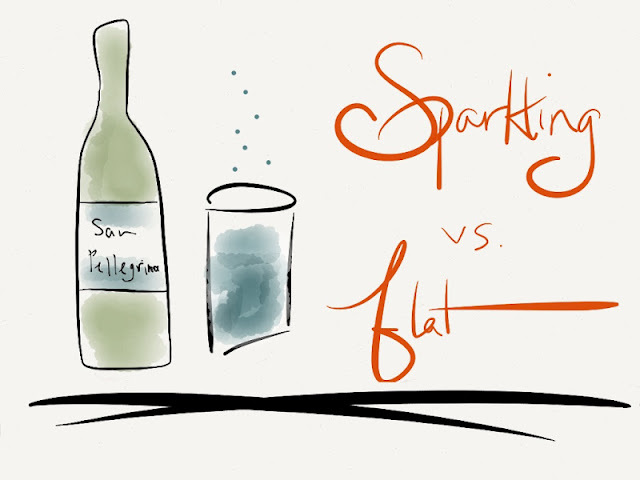 If things get too "sparkling", you may start to miss the "flat" things.